“We want to work with the gun owners instead of against them,” said a suicide prevention coordinator in Utah. “It was like a punch in the gut,” Reeve said. That reckoning led Reeve and the two other co-owners to join a growing movement that aims to reduce gun suicides by spreading prevention techniques among firearm owners and sellers. It’s an effort that is slowly sweeping through gun country ─ states with high rates of firearm ownership, like Utah, that have shouldered a disproportionate weight of America’s rise in suicides. The endeavor has brought together longtime adversaries: the medical community, which typically sees guns as a public health threat, and the firearms industry, which distrusts most efforts to restrict access to guns. Aposhian was drawn into the issue in 2013, when Steve Eliason, a Republican member of the Utah House of Representatives, asked for his support on a campaign to curb suicides. The pitch included some alarming statistics: Utah had one of the country’s highest suicide rates, and half of them were by firearm. Of all of the state’s firearm-related deaths, 86 percent were suicides. Aposhian joined the Utah Suicide Prevention Coalition, which has developed literature to distribute at gun shops, produced videos and created a suicide-prevention training module for concealed-carry training courses. “We’re to the point now where we felt it would be a disservice and inappropriate to our membership to not let them know what’s going on in Utah and across the nation,” Aposhian said. The Utah partnership has trickled down to communities all over the state, including Washington County, where Rowdy Reeve’s range is and where nearly half of all households own at least one firearm and many children grow up handling them. The suicide rate there is twice the national rate. “We want to work with the gun owners instead of against them,” said Teresa Willie, the county’s suicide prevention coordinator. She oversees a campaign that includes public-education efforts at churches, schools and law enforcement agencies and running public service announcements on firearms and suicide before films at the local theater. “We don’t want to polarize the community at all," she said. Reeve sought Willie out after the suicide at his range in early 2014. She visited the range, and taught his workers how to identify warning signs from customers who could be suicidal — and how to help them. As Reeve listened, he felt a deepening sense of responsibility. “If we are going to be selling these things, then we should also offer people help if they have any problems,” he said. The affiliation between the gun industry and public health advocates has its roots in New Hampshire, where in April 2009 a gun shop owner named Ralph Demicco found out that three people in one week had killed themselves using guns bought at his store. The news shook him; he considered himself a socially responsible business owner, and was cautious about selling firearms to people who seemed risky ─ drunk, on drugs, agitated, inexperienced. He was already a member of the New Hampshire Firearms Safety Coalition, which pressed gun-safety issues. “I was bewildered. I didn’t know what to do,” Demicco recalled. One of his colleagues from the coalition asked if he would help in a new suicide prevention effort, driven by research that identified guns as a major risk factor ─ not because gun owners were more suicidal than anyone else, but because suicide is often impulsive, and guns are an effective means of death. Suicide prevention advocates needed Demicco because they knew gun owners would trust him more than they would public health officials. Demicco agreed, and together they created The Gun Shop Project, distributing posters to retailers with tips on how to spot and help people who appear suicidal. The Gun Shop Project has since spread to 10 more states, including Utah, and there are similar partnerships in about 10 others, according to the Harvard Injury Control Research Center. Some are homegrown. Others are the result of a joint venture by the American Foundation for Suicide Prevention and the National Shooting Sports Foundation, an industry trade group that distributes suicide prevention “toolkits” to retailers and ranges. “It’s a chance to overturn myths about suicide in the gun-owning community,” said Bill Brassard Jr., a National Shooting Sports Foundation spokesman. Among those myths, according to researchers, is that if someone wants to end his or her life but doesn’t have access to a gun, the person will find another way. Researchers say that making it more difficult for someone who is suicidal to access a planned means of death can buy time until the suicidal thoughts subside. That is particularly important in the case of guns, which, they say, are present in about a third of American homes and are the most lethal method of suicide. About 85 percent of suicide attempts with a firearm end in death, while drug overdoses — the most common method of suicide attempts — are fatal in less than 3 percent of cases, according to researchers at the Harvard Injury Research Control Center. Jacquelyn Clark, owner of the Bristlecone Shooting, Training and Retail Center in Denver and a member of Colorado’s firearm safety coalition, redoubled her efforts after a first-time customer shot himself at her range two years ago. Clark revamped her staff training and offered more customer-education literature, from suicide hotlines to gun-storage tips. She sought advice from other gun shops, adopting some of their rules, including a prohibition against new customers using the range alone without a recommendation from a family member, colleague or friend. The staff now looks more closely at new customers — and regulars — by examining eye contact, attention to safety briefings, and whether they seem in a rush. Clark’s staff turns away more people now. Employees once asked a regular customer, upset because his wife had left him, to come back another day. They once asked a new customer, who was alone and seemed to want to rush through a handgun purchase, for a personal reference; instead, he left. Some of these people leave angry. Some may not be dangerous to themselves or anyone else. But the cost of lost business is a price Clark said she’s willing to pay. “These can be difficult conversations, but you’ve got to have them,” Clark said. 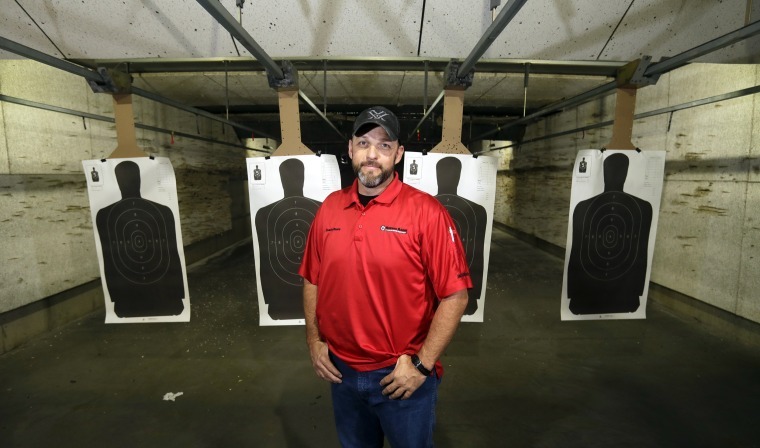 In the city of Loretto, in rural central-south Tennessee, firearms instructor Matt Holt sees those uncomfortable conversations as a personal crusade. Four years ago, Holt learned that one of his closest friends had taken his own life with a gun. That motivated Holt to work with the Tennessee Suicide Prevention Network to persuade the state to require a suicide module in the state curriculum for handgun carry-permit training. The change went into effect July 1. When Holt teaches the 10-hour course, he starts the suicide section by telling his students about his friend — and other friends and family members, including his mother, who have tried to kill themselves. “I try to engage them, to get them talking about it. Really talking,” Holt said. He tells them about the signs of suicide, what to say to someone who exhibits them, and how to find a safe place for their guns. Last year, a man in his 40s walked into Rowdy’s Range & Shooter Supply and asked to speak with someone in charge. Reeve and his two co-owners came to the desk and began chatting with him. “I’m suicidal,” the man said. He wanted help in keeping himself away from guns. He asked them to take his picture, share it with their staff and tell them that if he returned and inquired about renting a gun, to refuse. By then, Reeve had become trained to teach a suicide prevention course and was no longer unnerved by such conversations. He and his partners quickly agreed to the man’s request. They kept chatting for about 45 minutes before the man shook their hands and thanked them. He said he hoped he wouldn’t see them again. He hasn’t. Last Reeve heard, the man was doing fine.